At the Consumer Electronics Show (CES) today in Las Vegas, we announced that IBM is building its first IBM Q Quantum Computation Center in Poughkeepsie, NY. We also announced IBM Q System One, designed to take quantum computing beyond the research lab and into commercial quantum computation centers. The system was created by IBM Research scientists and systems engineers , drawing on IBM Q’s experience building and operating real quantum computers over the last two years. The team also worked on the design with industrial designers, architects, and manufacturers from Map Project Office, Universal Design Studio and Goppion. The IBM Q Quantum Computation Center in Poughkeepsie is home to the first universal approximate quantum computing systems installed outside of a research lab. These advanced systems are available to members of the IBM Q Network, a worldwide community of leading Fortune 500 companies, startups, academic institutions, and national research labs working with IBM to advance quantum computing and explore practical applications for business and science. 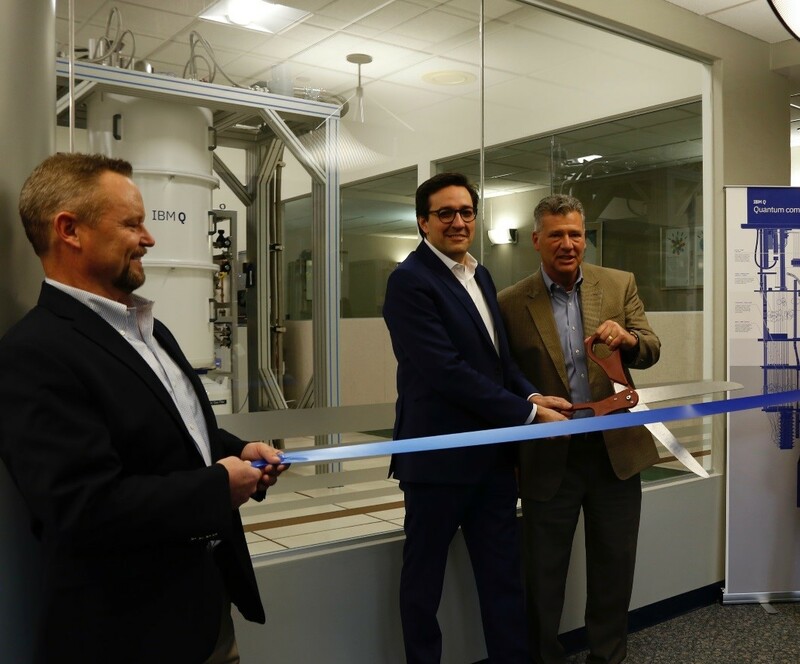 Dario Gil (COO, IBM Research) and Tom Rosamilia (SVP, IBM Systems) at ribbon cutting ceremony for Poughkeepsie IBM Q deployment. The Center introduces a new era of quantum computing at a location steeped in the history of classical computers. In 1952, Poughkeepsie was the development site for IBM’s first line of production business computers, the IBM 700 series. These systems introduced the concept that performance involved more than just processing, but also memory, input and output. In 1964, the IBM System/360 revolutionized the world by changing the way businesses thought about computer hardware. We may look back at IBM Q System One as doing for quantum computing what the System 360 did for classical computing. To make a similar leap for quantum computing, IBM assembled a world-class combination of industrial designers, scientists and engineers, all with a unique skillset. The IBM Q System One is the culmination of the combination of years of experiments at IBM Research demonstrating the fundamentals of quantum information science and over two years of operation of a cloud service providing access to real quantum computers. Since IBM made access to our first cloud-based quantum computer publicly available in May 2016, more than 100,000 users have run over 6.7 million experiments through the IBM Q Experience. Building quantum systems that deliver this level of stable, continuous cloud access for thousands of users requires sophisticated systems design and development. IBM Q systems are auto-calibrated daily to deliver a stable, continuous system. This has enabled our IBM Q Network partners and our IBM Q Experience users continuous cloud access to real quantum computers. We look forward to working with our IBM Q Network partners to explore the use of quantum computing for areas such as discovery of new materials, financial portfolio optimization and artificial intelligence. This will further Poughkeepsie’s pivotal computing legacy. The post Opening the first IBM Q Quantum Computation Center appeared first on IBM IT Infrastructure Blog.